Everyone has their foibles, but some Russian writers made an art form out of their idiosyncratic attitude. RBTH presents five of the best. Pushkin was well known for his superstitious outlook, which sometimes verged on paranoia. However, on several famous occasions, his seemingly random premonitions did appear to come true. In December 1825 Pushkin decided to make an escape from his mother's rural estate of Mikhailovskoe (Pskov Region, 350 miles north-west of Moscow), where he was in exile. As he made his way to St. Petersburg a hare crossed in front of his carriage, which the writer considered a bad omen. He immediately returned to the estate. The twist in the tale was that this took place on the eve of the December Uprising, when a group of nobles demanded restrictions on the Tsar's power and a constitution. The fact that Pushkin did not press on to St. Petersburg meant he could not join the revolutionaries on Senate Square – an act that gained most of them lifelong imprisonment in Siberia. This was one of Pushkin's favorite stories and he would often retell it. Twenty years before his tragic death, the writer received a prophecy that he would be killed by a "white man" with a "white head". In 1837, Pushkin was mortally wounded in a duel by Georges d’Anthes, who was wearing white coat and had blond hair. Gogol had numerous eccentricities and worries, but the one that haunted him the most was taphophobia: a fear of being buried alive. To prevent this horrendous fate, he would sleep sitting upright and included a special point in his will requesting that he was only buried when his body was clearly decomposing. Gogol died in 1852 and was reburied in 1931. Some witnesses of the exhumation reported that the writer's body was in an unnatural pose. Pure coincidence, or the last movements of a man whose worst fear came true? The rock of Russian literature is known for his vibrant, energetic prose, but he also had a strong propensity to fall into a catatonic sleep – a side effect of his epilepsy. "Every time he went to bed, he would ask me not to bury him for at least three days if he succumbed to catatonia," recalls Konstantin Trutovsky in Memoirs About Dostoevsky, the first book about the writer. "He had a perpetual fear of it." Dostoevsky was widely known for his unstable physical and mental health, even gaining the interest of Sigmund Freud, who wrote several articles about him. Many writers have a special ritual that helps their creative juices flow, but Nabokov took it to another level entirely. He wrote his novels on small rectangular index cards that held around 150 words each. He would work in a non-linear way, writing down random ideas as they came to him and only numbering and combining the cards into a single text right at the end of the process. This atypical way of working gave his publishers a real headache when it came to his final, unfinished novel, The Original of Laura. He had not numbered the 138 cards before he died and it took almost 30 years of debate for a version to be released. Whether it is the version Nabokov planned is a matter for another few decades of discussion. One of the co-authors of Little Golden America and The Twelve Chairs was nothing if not a wistful character. One of his favorite pastimes was writing letters to nonexistent people. He would come up with fictional names and addresses and send the letters to different parts of the globe. When these letters were inevitably returned to sender, Petrov would take delight in receiving the envelopes covered in numerous foreign stamps and postmarks. It was a foolproof system – seemingly. 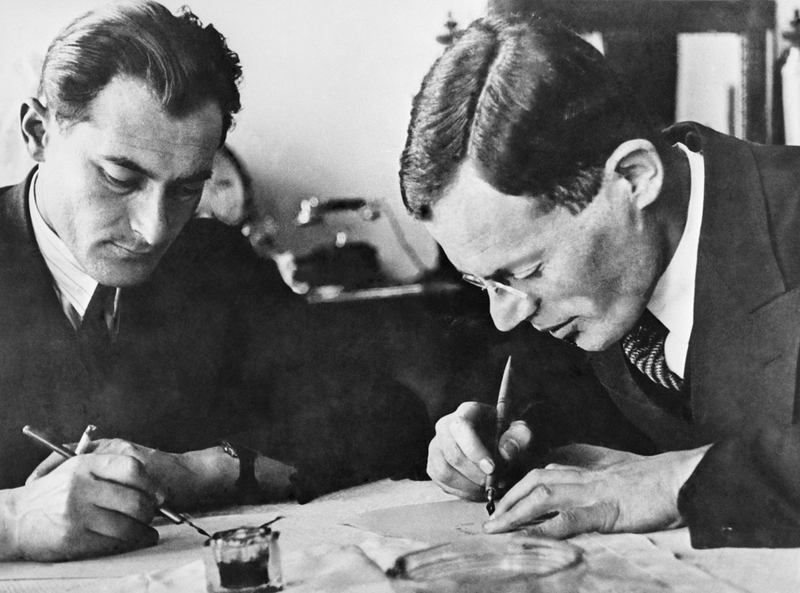 Legend has it that Petrov sent a letter to New Zealand in April 1939, using his tried-and-tested method of inventing a destination and recipient, in this case one Merill Eugene Wellesley. When the undelivered letter hadn't been returned to him in a few months, he decided that it had simply been lost in the system. However, in August that year, he received a letter from New Zealand in the mail. It was a clear and direct reply to Petrov's own message to Wellesley. It even included a picture of the writer hugging a man he had never seen. In an attempt to work out just exactly what was going on, Petrov wrote a second letter to the mysterious Wellesley, but he died before he could receive the reply.